(b) where it is clear to an ordinary user that the content is fiction." So, Art Harun continues, satires and parodies are expressly and very clearly excluded from the definition of "false" content. "This is MCMC's own regulation. And yet they are charging Hassan Skodeng." Read his posting Holy Mother Crap! Why is Hassan Skodeng smiling? So what's up, MCMC? AG's Chamber, any idea? 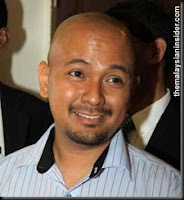 WHO ARE THE LITTLE NAPOLEONS OUT TO UNDERMINE NAJIB? Meanwhile, Pasquale has named THREE individuals he thinks are responsible for this latest circus. Find out who they are H E R E.
Kickdefella's asking, "Che Khalib makan pisang ke?" BN is testing the water, by subscribing to one of Command Democracy tenets, just like what her southern neighbour, PAP is practicing. Replace ISA by Defamation Suite. U usually get hammered for yr "pro-govt" posts... but this is the one time where everyone should stand united and condemn the stupid charge.